Lu An Gua Pian is one of the best Green tea to come from Lu An County in An Hui province of China. This is no small feat considering An Hui is renowned for producing a variety of high quality green teas since the Tang Dynasty. It is also a China's Ten Famous tea and was winner of the China Tea Award in 1982 and China Food and Drink Award in 1988 for its superior refreshing taste and quality. Gua Pian is unique because it is processed using only the leaf part (without the bud). The history of Lu An Gua Pian dates back to the Tang Dynasty, where records where found in Lu Yu's Cha Jing (first ever book on tea) describing it as a "Superior Tea", and it was also a tribute tea in the Ming Dynasty. Lu An Gua Pian is said to be able to help improves vision and relief sleep disorder. The floral taste and aftertaste of a strong cup of Lu An Gua Pian is a reminiscence of Tie Guan Yin tea. The pleasant floral sweetness of this tea gradually fills your mouth. Very refreshing and smooth. Unlike other premium quality Chinse green teas, Lu An Gua Pian is made only using the tea leaves and no buds at all (similar to Japanese green tea). 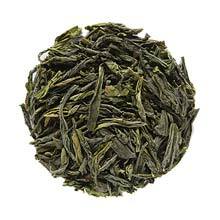 The emerald-green dried tea leaves are long and narrow.